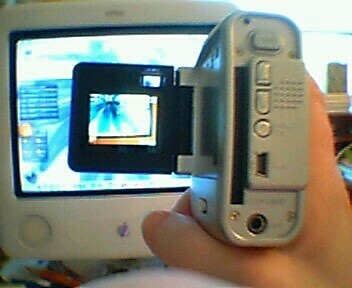 My last post includes a picture of my new digital video camcamcorder, posed next to my iPod so you can see how tiny it is. Here is another shot of the 4100 in action. You can get it for under $100 at Sam's Club. Very small, very light, can also be used as a still digital camera, a web cam, and a voice recorder. The videos are not professional quality, but they are not bad at all. Don't have money for an expensive digital camcorder? Or do you have one that you don't carry around because it is too heavy/bulky or you are afraid you will lose/break it? Want to give your kid a real video camera that is priced like a toy? Check out the Aiptek 4100M. I love mine! !